Readerware 4.03 has been released. Introducing the new Readerware automatic backup facility, compressed web page support and general maintenance. 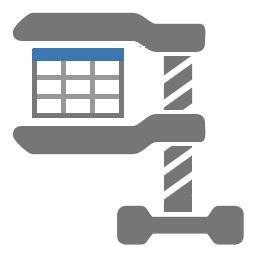 A Readerware 3 maintenance release is also available. Readerware 3.64 addresses a problem accessing Amazon. Plus we revisit running Readerware from a thumb drive. A full list of the changes included in Readerware 4.03 is available in the release notes. A full list of the changes included in Readerware 3.64 is available in the release notes. You can also access the release notes from Readerware itself, select the Help->Release notes menu item. This upgrade is recommended for all Readerware 4 users. It is very important to regularly backup your database to protect your valuable data, and Readerware has always included a built in backup facility. A common request has been to automate the Readerware backup process. Stepping through the backup wizard every time is tedious. You have asked for a simpler way to backup your database. This has been on our list for a long time. It almost made it into the initial release of Readerware 4, but we had to pull it at the last minute because of problems. Finally it is here. Readerware can now automatically backup your database with no user intervention needed. Readerware can also manage your backup files. Tell us how many backup files you want to keep and Readerware will take care of it, deleting older backup files. 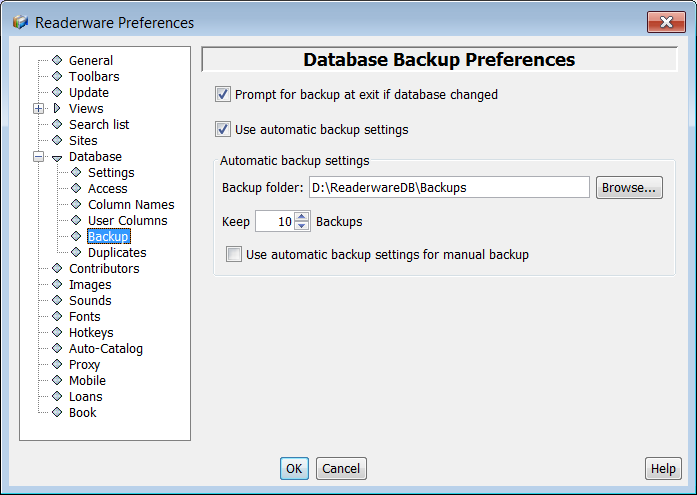 Setup is easy, select the Preferences menu item, then Database, then Backup. The backup prompt option has been moved from the General preferences panel to the Backup preferences panel. If checked Readerware will prompt you to backup your database at exit if you updated the database. When the prompt is displayed you can select Yes to run the backup, No to exit Readerware without backing up your database or Cancel to return to Readerware. Check the Use automatic backup settings to automate the backup process. Click on the Browse button to select the folder where you want to store your backup files. This can be any available drive, you can backup to your hard drive, to an external hard drive or thumb drive, to a network drive etc. You can also backup to your cloud drive folder so that your Readerware backup files will be saved to the cloud. Tell Readerware how many backups you want to keep, between 5 and 25 iterations can be saved. Readerware will keep track of all the backup files it creates and will start to delete backup files once your limit is exceeded. The final option Use automatic backup settings for manual backup controls what happens when you select the File->Backup Database menu item. By default the normal backup wizard is displayed allowing you to create a separate backup file wherever you want. If this option is checked, Readerware will launch the automatic backup instead. 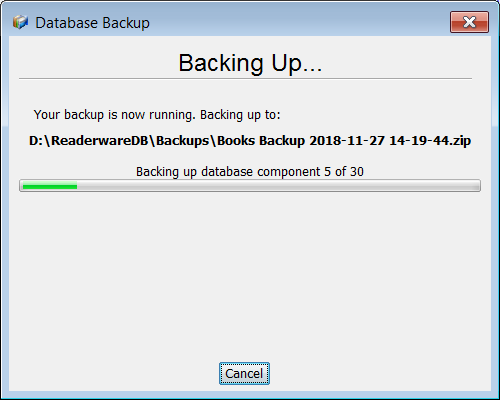 What happens when you exit Readerware after updating your database depends on the settings of the two check boxes, Prompt for backup at exit if database changed and Use automatic backup settings. If neither option is checked, Readerware will exit without backing up your database. This option is not recommended unless your database is on a server or your computer is backed up using third party software. If just the prompt option is checked, Readerware will prompt you to backup your database when it has been updated. If you reply Yes the standard backup wizard is launched. If both the prompt and automatic backup options are checked, Readerware will prompt you to backup your database when it has been updated. If you reply Yes, the automatic backup runs. Once complete, Readerware will close. If just the automatic backup option is checked, Readerware will always run an automatic backup when your database has been updated. Once complete, Readerware will close. What does the automatic backup actually do? Readerware will create a new backup file. The name is generated automatically and will include the database name, the date and the time it was created. This means that you can backup your database multiple times a day, each backup will be a separate file. The timestamp uses a 24 hour clock so the backup files will be sorted automatically, the latest backup will be the last backup file listed. The database name is included in the backup file name so you can easily identify the latest backup file for your database, even if you have multiple databases. The backup is launched automatically, there is no user intervention required. When the backup completes, Readerware will close. So you can just close Readerware, watch the backup start and step away from your computer, you don't have to wait for the backup to complete. You can cancel the backup if you change your mind, Readerware will cancel the backup as soon as possible and it will delete the partial backup file. If there is an error during the backup, Readerware will display an error dialog and Readerware will stay open until you acknowledge the error. One final thing to think about when using the automatic backup. Do you want Readerware to prompt you to backup or just run the backup automatically. The larger the database, the longer it will take to backup. If your database is on the smaller side, you might choose to run the backup automatically each time. If you have a larger database which takes several minutes to backup, you might want to set the prompt option and choose to run the backup when you have finished for the day. You can try automatically backing up every time, you don't have to wait for the database to close. But if you are closing Readerware to use another application and you find that the backup takes too long, you can turn on the prompt option. You may have noticed that Readerware had a problem accessing Amazon websites recently. We had to update Readerware, both Readerware 3 and Readerware 4 to address this issue. If you haven't upgraded already you should upgrade to Readerware 4 02 or better or Readerware 3.64 or better. This was our problem. When a client contacts a website there is a conversation that takes place where the client, i.e. your browser or Readerware in this case, tells the website what formats it can support. Readerware was not doing this and that is what caused the problem. It was a surprise because Readerware has always done things this way and every website sent us text pages. But it turns out that the official web standard says that if a client doesn't specify a list of supported formats, it can accept any format. Amazon started serving us compressed pages, according to the standard that is perfectly valid, but unfortunately we couldn't handle them. The change we made was to tell websites that Readerware wanted text pages. That solved the problem and we were able to connect to Amazon again. However we decided to look at compression. Amazon wanted to send us compressed pages, they are a lot smaller, they transmit faster, everyone benefits. So in Readerware 4.03 we added support for compressed web pages. We can receive the smaller pages and decompress them in Readerware. The surprise was that once Readerware told servers that it can accept compressed data streams, everyone started sending us compressed data, not just Amazon. Virtually every site now sends us compressed pages. It is their choice, they decide what they send us, but web pages are getting bigger and bigger. It makes sense to compress the pages to make them faster to send. This is an important change in Readerware. It means that we now let the website decide how to transmit a web page. It means that you use less bandwidth when cataloging. Everybody benefits from this change. Please consider upgrading to Readerware 4.03 to take advantage of this improvement. One of the issues we fixed in this release of Readerware 4 was with the portable installation function. We had not updated it for Readerware 4, it was still trying to copy Readerware 3 files and failed. With Readerware 4.03 you can now create a Readerware 4 portable installation on a thumb drive. So this seemed like a good time to revisit the Readerware Make Portable function. Have you ever wanted to put Readerware and your database on a thumb drive and take it with you from computer to computer. Now you can, you can create a customized version of Readerware on a thumb drive or other portable drive along with your database. Take it with you, you can plug it in to any machine and run Readerware, no install required. Have you ever thought about putting your database on a CD/DVD and letting others search and view it? Now you can, you can create a customized version of Readerware on a CD/DVD along with a read only copy of your database. Anyone can pop the disc into their machine and browse your database. When selecting the CD/DVD option, you should select a staging folder where Readerware will copy the files. You can then burn them to disc. Readerware Client/Server Edition lets multiple users connect to a central database providing you with an easy way to let users within your organization get access to the central Readerware database. You can even set different access levels. One issue we heard about from some client/server users was that having to install Readerware on individual machines was time consuming. No more, you can create a customized version of Readerware and make it available on your network. Users can run Readerware, no install required. You create these installs from within Readerware. This lets you configure Readerware just the way you want and create customized installs. Select the File->Make Portable menu item to create the portable installation. If you put Readerware on a thumb drive, you can use it as your main Readerware installation. Remember to backup your Readerware database in case you lose the thumb drive. If you will only be using the thumb drive temporarily, you can move the database back from the thumb drive to your computer when you are finished. Select the File->Import Portable menu item. There is a knowledge base article with more on installing Readerware on a thumb drive. If you haven't already, you can still upgrade to Readerware 4. The upgrade to Readerware 4 is free for all users who purchased Readerware 3 or upgraded to Readerware 3 on or after January 1st 2017. This is a lot longer than our official upgrade grace period and is for Readerware 4 only. If you are eligible for the free upgrade send your upgrade request to upgrades@readerware.com Please include sufficient information so that we can locate your original order and send you new registration codes.